Sign installation can drastically improve the visibility of your business. Make sure people see your message with Graphic Installation professional and efficient crew. We will install all kinds of signs. Large-scale banners, digital signs, monument signs, any kind of exterior signs, menu boards, traffic, and regulatory signs — we can install them all anywhere in the U.S.
A vivid, colorful sign post installation, visible from anywhere, is well worth the effort. If you need to attract attention to your business, there is no better way to do it. When you put it on a paper — the investment in a quality sign and the outcome – numbers are looking great. It becomes easy to do the math. Quality visible signs attract more customers, which means more money for your business. You will immediately have the desire to go even bigger. Whatever idea you have, our signs installation crew can follow it. Contact us today to learn about many sign installation options Graphic Installation crew provides. We have all the necessary equipment to do the job right, and we can handle everything from window graphics, floor graphics and pavement graphics to large-scale banners. If you need a road sign installation or led sign installation, or any sign installation in NYC area or any other area in the U.S., we will be happy to do it. We achieve this by using the latest high-quality tools and technology. Also, our sign windows installer experts are more than capable to handle site signs, building directories, ADA signs, monument signs, and any exterior signs. Our fully-equipped sign installer crew offers the best sign installation services for any kind of advertisements. 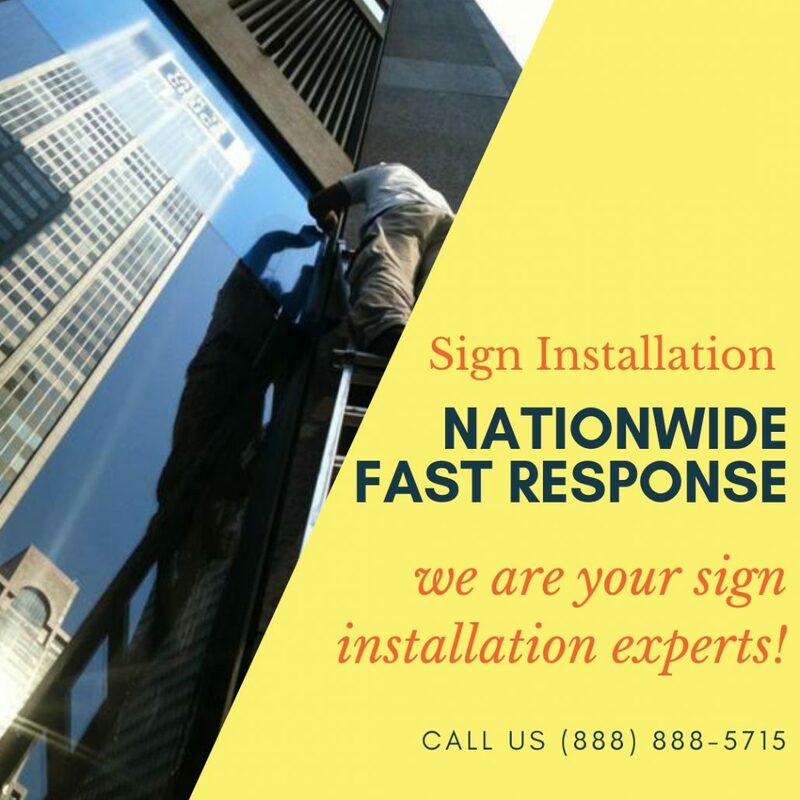 Whether you need real estate sign installation, road sign installation or a sign windows installer experts to complete the job as soon as possible, we are 100% reliable and highly efficient sign installation company. We make sure that your signs are properly installed, whether it’s a signboard installation or parking sign installation. Making sure that the installation process runs smoothly – free of any kind of damage, is one of our top priorities. The best feature our billboard sign installer’s crew has is – safe and risk-free. If you are in the real estate business, a sign is the first thing people will notice, even before they see the house. If the sign is cracked and worn out from the sun and rain, that’s not much of the first impression. If you need professionals who can complete real estate sign post installation and replace an old sign with the new one – you found them. You can find design and quality material for real estate sign installation before you come to us elsewhere, or you can save your time and hire us to do sign fabrication and printing. This is the first step when you decide to invest in sign installation. Of all sign installation companies out there, make sure to choose the best one — Graphic Installation crew. Get a Safe & Secure Sign Installation Service Anywhere in the U.S.
Advertising signs are the best-kept secret of business owners. These signs help them to achieve more walk-ins! This is especially true in the real estate market. If you are in this business, real estate sign post installation is the fastest way to attract new customers. Our real estate sign post installation services are in the hands of experienced and licensed professionals. They can handle any kind of buildings. They will carefully listen to your ideas, but also won’t hesitate to give you a professional opinion based on years of experience. If you already know how much a sign installation service can help you, then you also know how important the safety features are. Our crew will make sure that to install it with most care. We leave no loose ends. We will find the most practical way to install the sign and let it take the spotlight. Sign installation companies can promise you a miracle. We are more down to earth and will make it look like it floats. Safety is most important, and we will make sure the signs are 100% secure. Some companies can get carried away in this process and make unnecessary moves that will start to distract people who are looking at the sign. We are not one of those companies. Nobody will ever think that the sign installation could have been done better because we find the best way to do it at the start of the process. We have years of experience and we promise a quality workmanship. Once you choose to go with our eye-catching sign board installations, you can relax and see how you easily and successfully achieved another business goal. Signs and billboards should leave a lasting first impression and portray the professional image of your business. If it’s time to remove an old sign and replace it with a new one – we are going to make sure our sign installers run the process as smoothly as possible. Our sign post installation business services will adapt to the working hours of your business. Without interrupting your daily operations, the following day will bring the new look of your store. It’s Time to Install Your Signs. Call Sign Installation NYC Graphic Installation Crew today! We are reliable and your best bet to complete your projects on time. Furthermore, we will make sure that it fits your budget. Contact us for any questions you may have regarding sign estimate and cost. Our crew is more than happy to walk you through the process. We are able to make a plan that is going to fit your time-frame. Our company is based in New York, New Jersey, and Boston, but we happily go nationwide and efficiently complete sign installation projects. 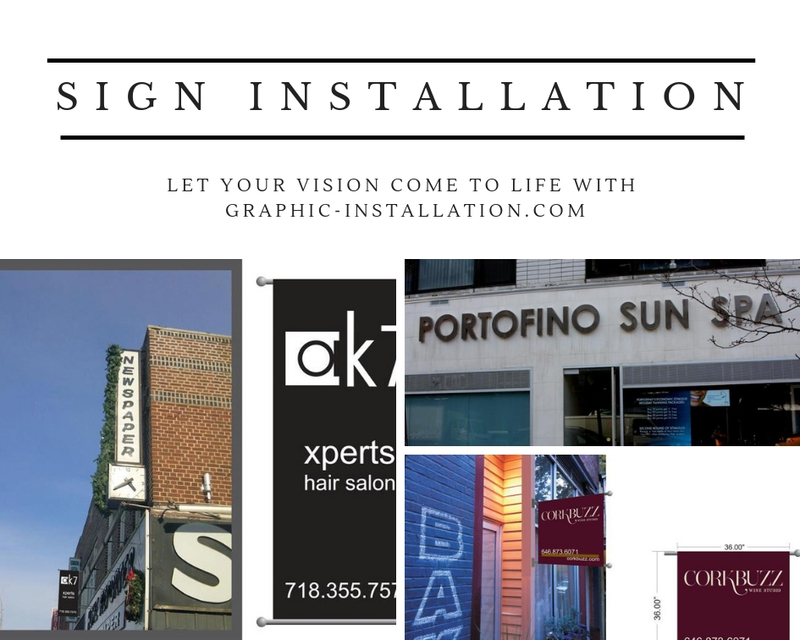 You can say that we are ”sign installation near me” kind of company, wherever you are located in the U.S. We are well known as a highly professional sign installation NYC expert crew. Our sign installation services will fit both your needs and your budget. With us, you will get the best sign installation services there are. You will be satisfied with the outcome, and your business will take that much-needed spotlight. That’s one of the reasons why our customers keep coming back to us. Trust that we inspire and expertise that we provide give you even more reasons to hire us today. You can trust us with your advertising signs, and get the best set of hands for that last installation step. Years of experience have made our crew of billboard sign installers work efficiently and fast. These are the results everyone is looking for. Everyone is looking for the company that is trustworthy and quick — and that’s who we are. Contact us or call us at (888) 888-5715 if you need a quality sign installation in NYC or anywhere else in the U.S. Park sign installation, road sign installation, real estate sign installation, or any other kind of sign installations are our specialties. Our sign installers will make sure that the job is done safely, securely, professionally, and fast.